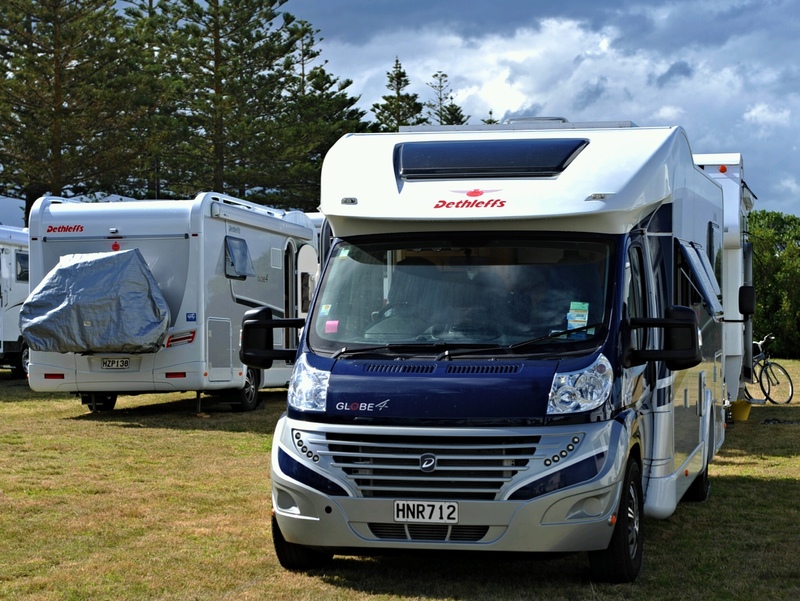 While we were in Napier in the waterfront park, who should also be there amongst the 150 odd motorhomes but Bruce and Raewyn in their Dethleffs Sunlight. They came in a little later than us and were lucky to get a waterfront view site where they could put out their awning. You can see the back of us on the left in the background. We spent a very pleasant happy hour with them with some others one night. When they took delivery of their new van just before Christmas, it was missing a knife and forks drawer and just came with a shelf where you could put a plastic tray down on non slip. Bruce decided that he was going to go one better and took the shelf out and make some drawers so he could make better use of the space. 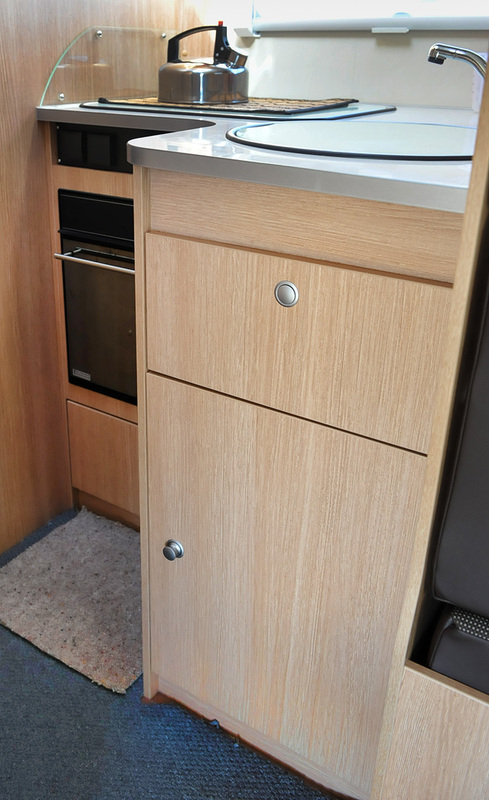 After finding that the veneer used in the rest of the van was almost impossible to get, he cannibalised the shelf into drawer fronts so he could match the colour of the van. 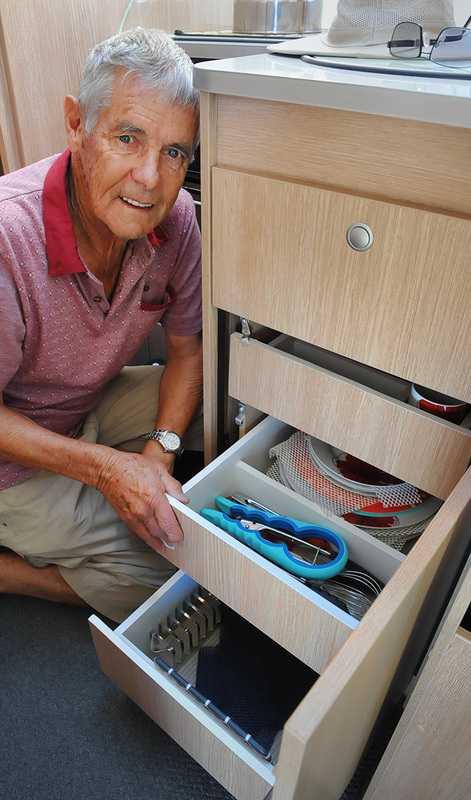 He measured up and bought some soft close drawer sliders and made three drawers to accommodate all their kitchen bits and bobs. A big improvement and one that really adds to the functionality of their galley area. 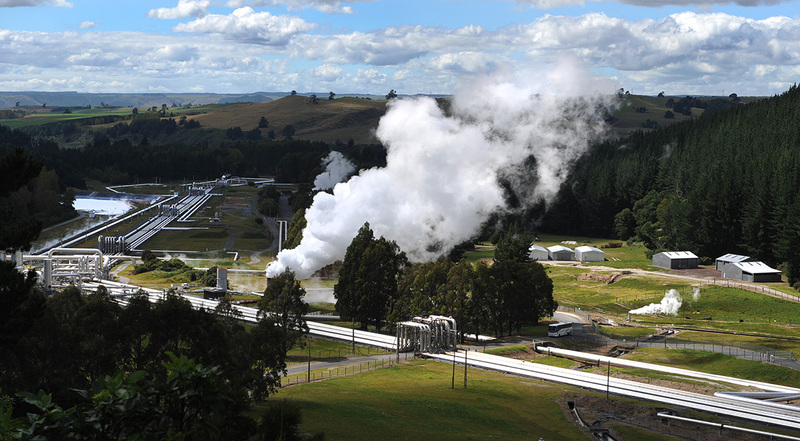 I don’t know how many times I’ve driven past Wairakei over the years but as we left Gary and Diannes place this time and we had plenty of time, I thought we’d get a closer look at where some of our power comes from. After taking a couple of wrong turns and ending up at a semi rural café and camping ground down a dusty road and getting rafe all covered in muck and another turn ending up at a Contact office block, we found the Lookout road alongside a BP service station. There is very little to say where the lookout is but the road leads along fences, past lots of expensive looking plumbing and you end up driving up a hill to the lookout. Well worth the effort. A panorama from the lookout. Click on this for more detail. I took a few piccies and we were on our way. Amazing to think that all that heat comes out from under our feet and creates our power or at least some of it. 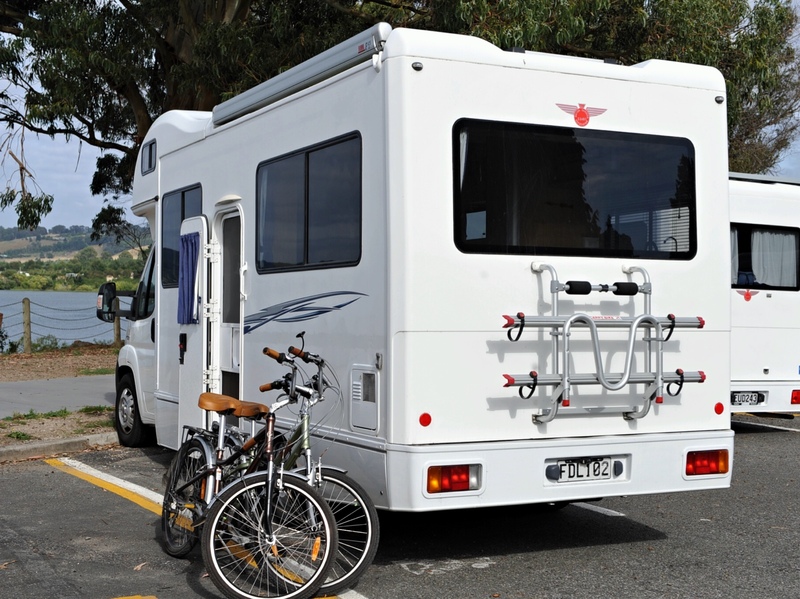 On arrival in Taupo on the waterfront, we pulled up next to Oliver and Noeline from Hamilton. 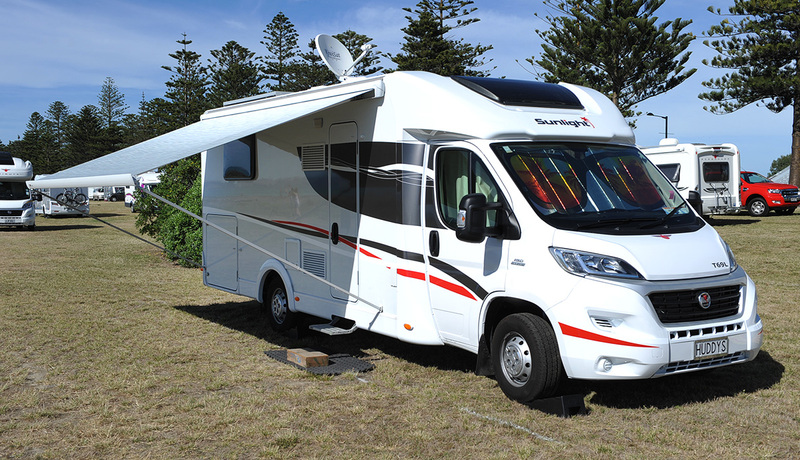 They purchased their 2009 2.3 litre Fiat Ducato 2 years ago so they take away their grandkids. The ex rental with a CI Munro back had done 110,000 odd k’s but is in exceptional condition. They’ve added solar power and more battery power along with a bigger TV and are really enjoying it. 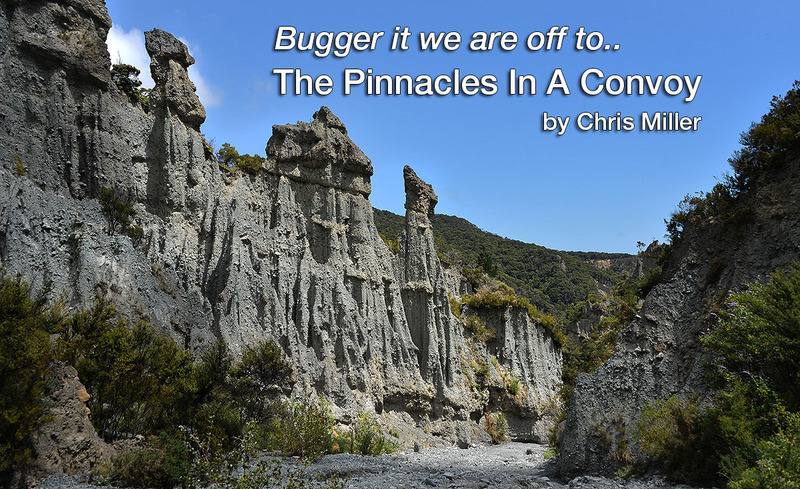 They recently did a trip right down to Bluff around the South Island and enjoyed some time at former west coaster Noelines old region. The van performed faultlessly all the way around and they are planning a trip into new territory up to the Bay of Islands and beyond. 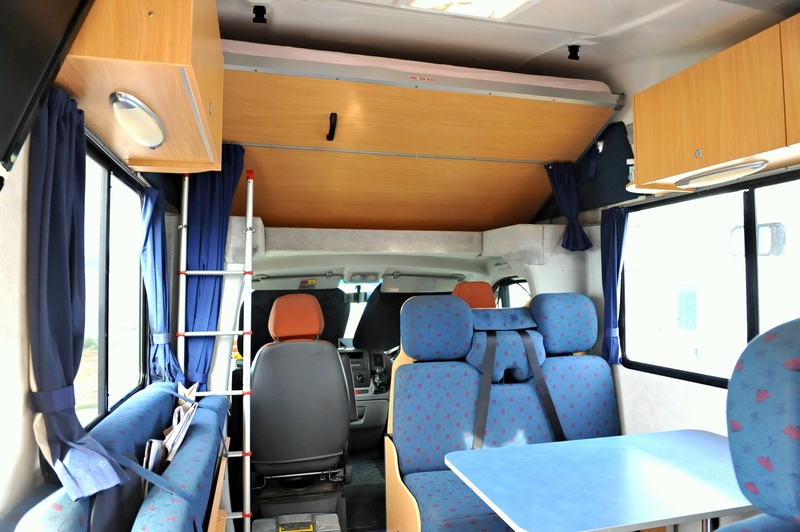 A really nice tidy functional Motorhome. We missed the shuttle for the second day in a row by all of 5 minutes! 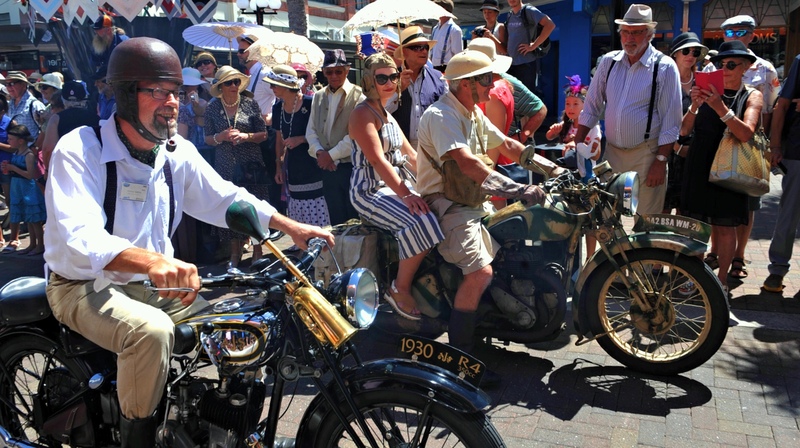 Punishment was a reasonably pleasant walk into Napier in the sun to see the Art Deco parade, the event of the festival. 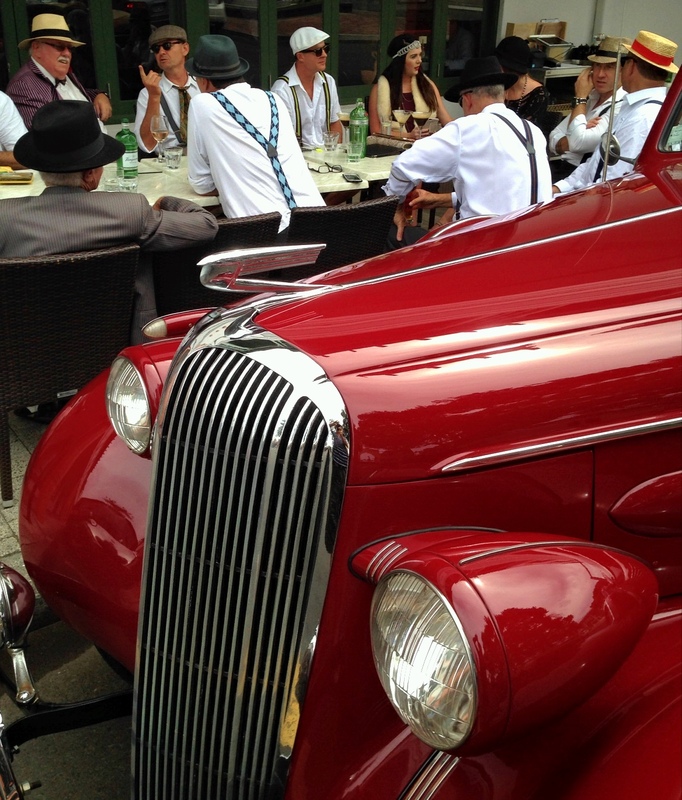 There were more than 250 cars, dancing on street corners, motorbikes, the NZ Army band, pipe bands, it was all on. Everyone was having fun. An amazing car/caravan combination on the walk to the parade. 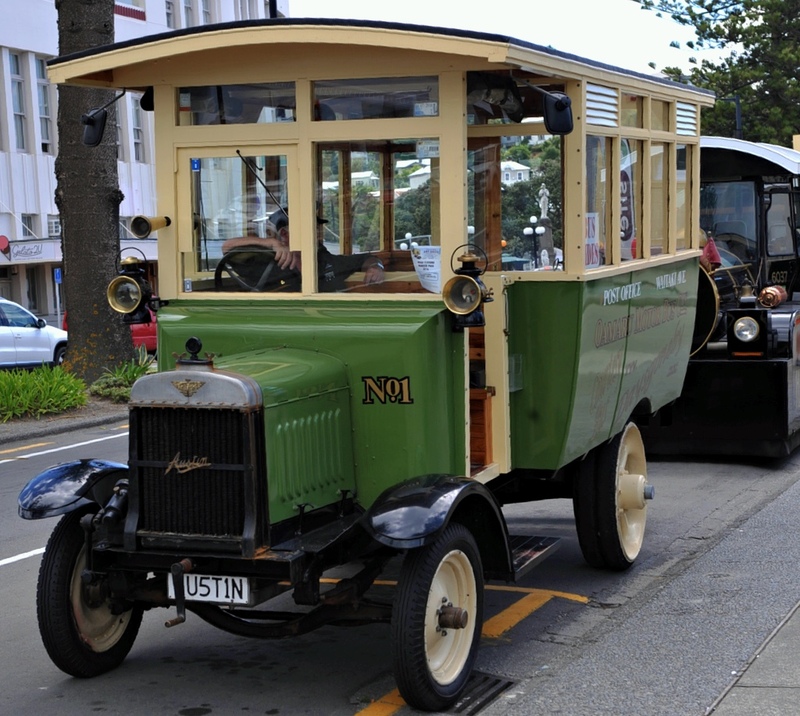 It seemed like half of NZ was in Napier, people everywhere. I parked myself on a traffic island after talking to a marshall and hearing the planned route. While I was waiting for the parade to start, I received a cell phone call from John, a boatie mate from Devonport. Where was I? Standing on a traffic island in the middle of the main street of Napier was my reply. It turned out he was in Napier too within eyesight and we were catching up after the parade ! How small is NZ ! Once the parade started, I had to keep moving. Great fun. Entertainment in the soundshell before the parade started. After the parade finished, we looked for a cafe to have lunch. On the way home, these people stopped so I could get a piccie if them. They were all chocker with all the people so we decided we’d head back to Rafe for some lunch. As we walked, we got a phone call from John who suggested a cafe on the way .. And we met John and Katherine shortly after.. amazing. They had been house sitting out of town and had come in for the parade. We headed back to Rafe after that and joined our Waiuku friends for happy hour and later tea for our last night in Napier. After sneaking out if the park to get some water and groceries and sneaking back in again, we missed the last shuttle bus to town so we walked the 1k or so into town to check out the fun and it was well worth the walk! Traction engines, steam rollers and so many amazing cars. 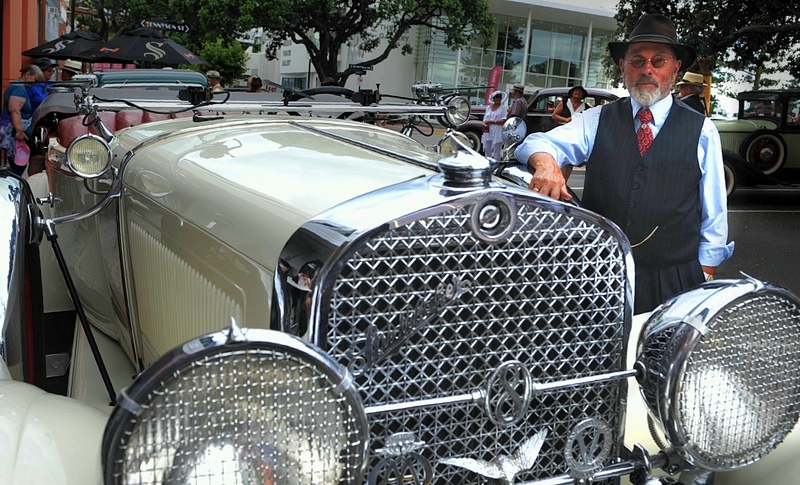 I got talking to Dave, the owner of a one off Studebaker that he got his license in when he was 15 and later bought the car. 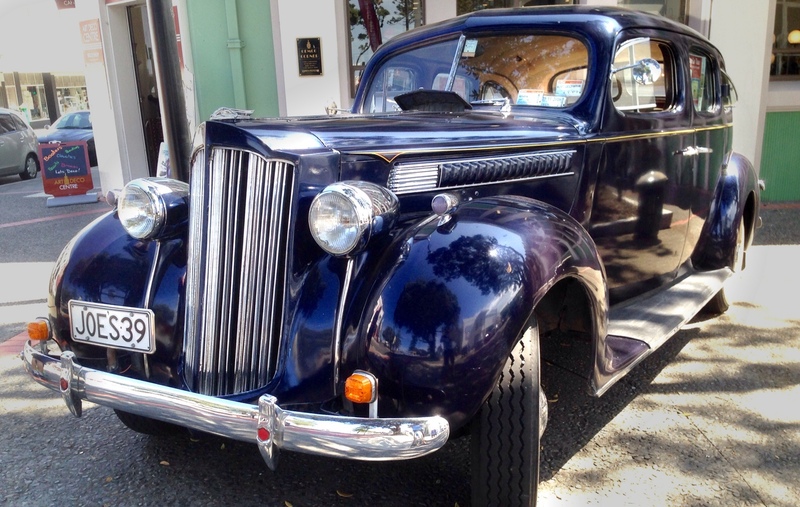 The car was made in Hastings with a wooden frame and has steel over the top with a full genuine Studebaker everything else in it. A lovely car. 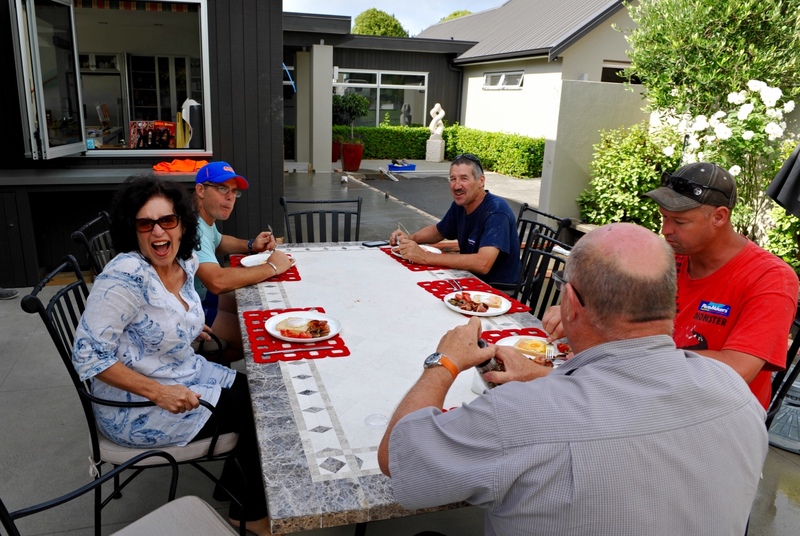 We bumped into Dave and Rosemarie and all the crew from Waiuku there and they were really enjoying the scene and we’re all dressed very nicely. The pictures below tell the story. 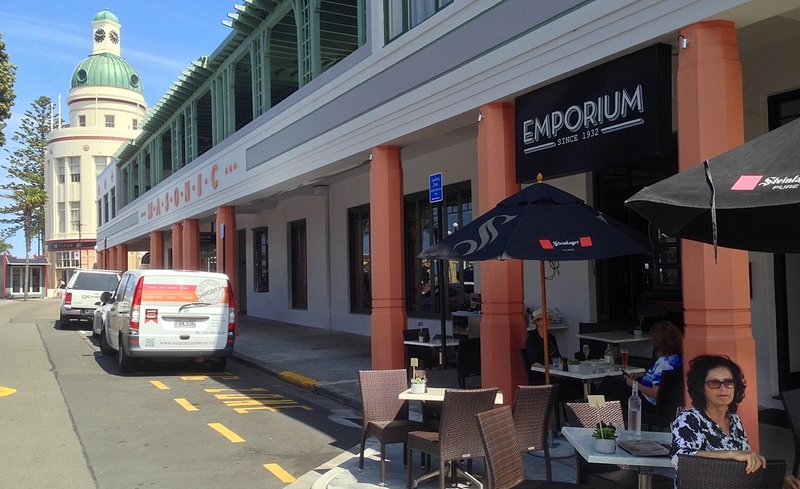 The retailers of Napier were all decked out in their finery, all enjoying he festival. 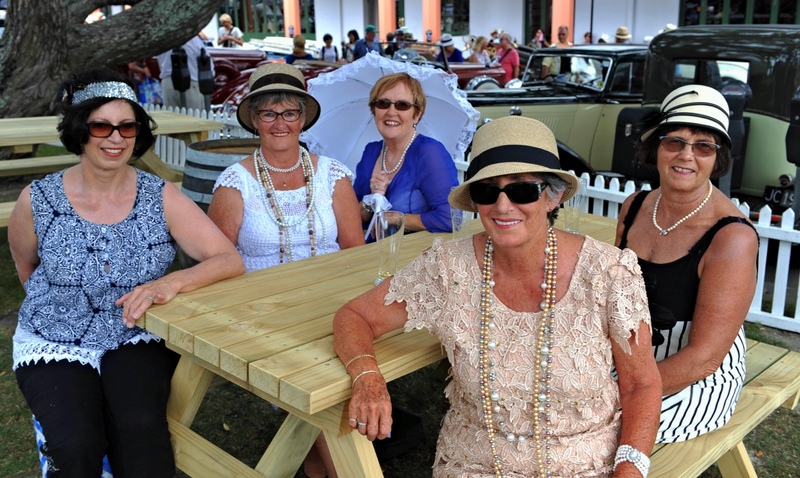 The ladies from Waiuku all decked out magnificently. Fiona on the left. There was a couple who turned a street into their dance floor with a busker and did a very impressive floor show for the crowd around. Very good dancers and the crowd really appreciated it. I even bumped into an old friend of mine Geoff who was also a photographer with me at the NZ Herald 30 odd yrs ago. NZ really is a small place ! As the day wore on and it got hotter, we found the 1918 Austin Bus was going our way home so after a $5 donation, we were on our way. A fun day and more tomorrow. We woke up this morning to find a whole lot more Motorhomes and another Dethleffs Globe4 right next door. I can count on one hand the number of Globe 4’s I have seen around on the road so to have one right next door was amazing. Two Globe 4’s in the same region! 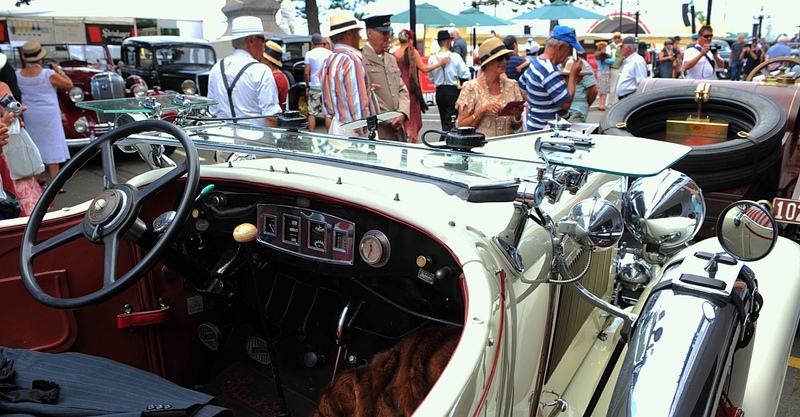 We met Bill and Lynley at the Dethleffs annual rally at Miranda late last year. They had then just taken delivery of their new van. Bill is a keen cyclist and suggested we have lunch at Ahuriri Cafe, a neat little cafe around by the port so we got ourselves organised and off we went. The sky was blue but black towards the west and the forecast was for heavy rain. Fiona riding past the marina. A great lunch and nice catching up with them both. 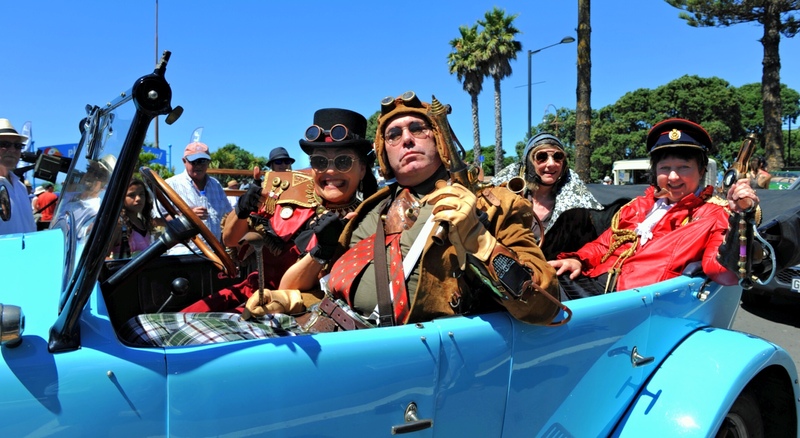 Just biking along by the port, we came across an elderly couple out for a walk in all their finery, him with spats, bow tie and plus 4’s and hat, her with her cloche hat, nice long period dress and fine shoes, bid us a very cheery good afternoon. Very nice and very friendly. Great atmosphere and everybody is enjoying the fun. 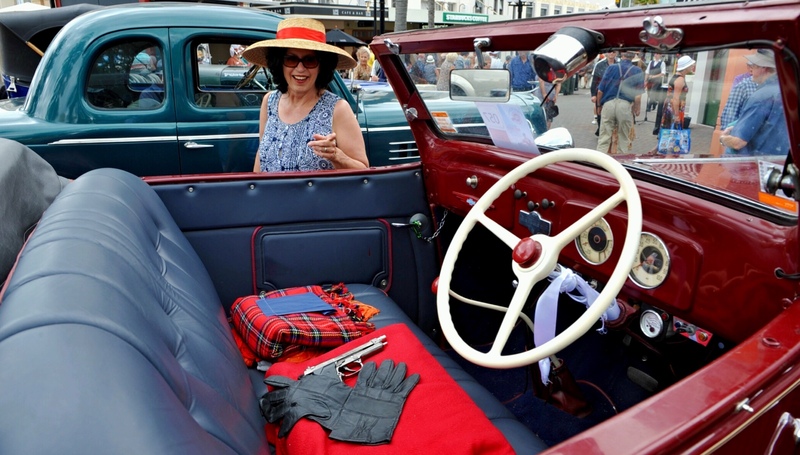 On the way back, we stopped at the Masonic to check out the vintage cars and people all dressed up enjoying the moment. We stopped for a yummy Gelato on the waterfront on the way back to Rafe and just got the bikes back on the rack when the rain came down. And with a sea view too. 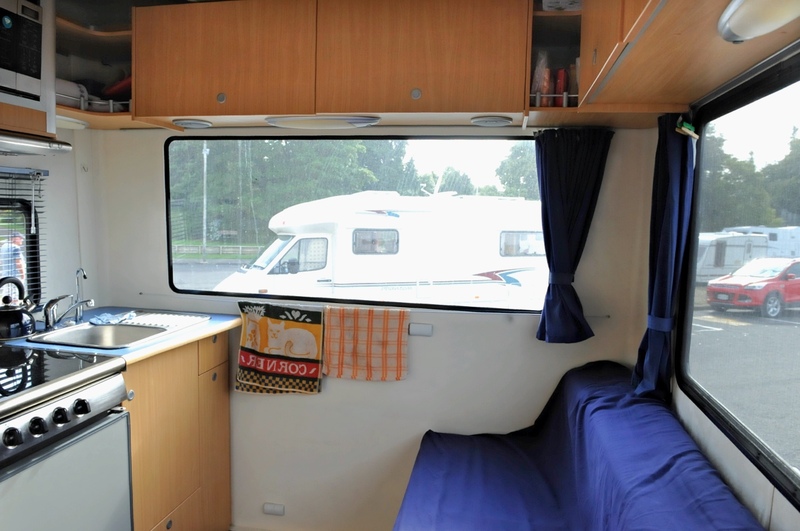 More than 90 Motorhomes and caravans. 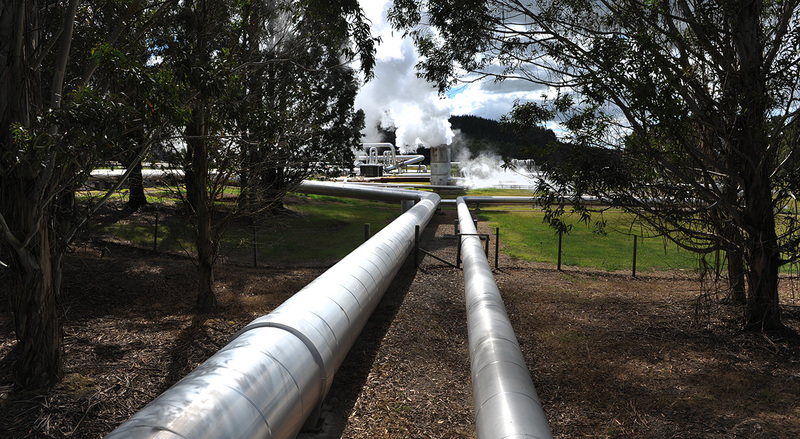 On Monday afternoon, we left Taupo after having filled up Rafe with fuel and headed for Napier. 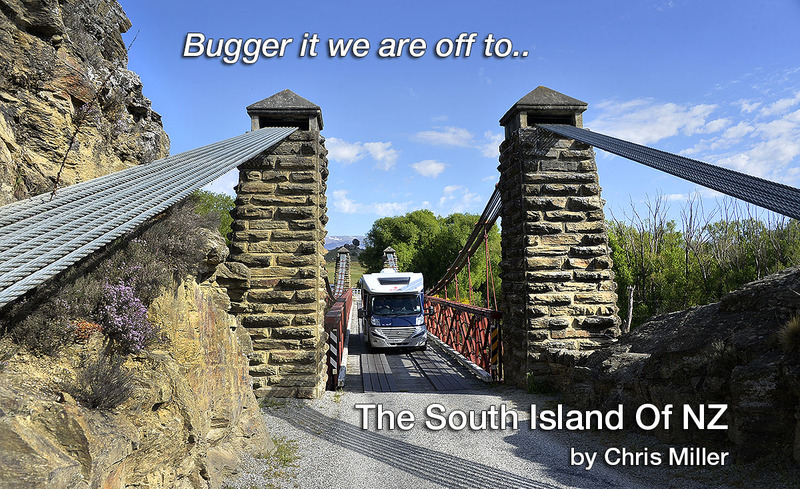 It was an easy run through with very little traffic and within a few hours, we found ourselves tootling down the Esk valley wine area into Napier. The GPS gave us the directions to the NZMCA park at Eriksen rd. 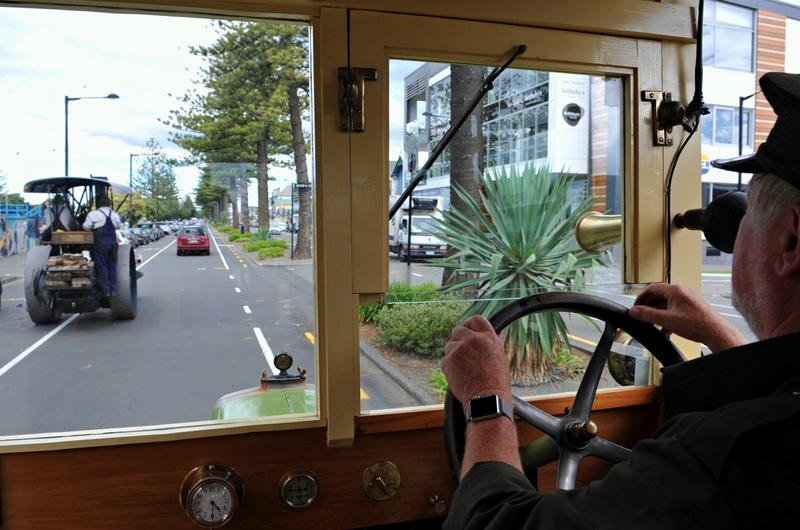 We parked Rafe and within minutes of walking around, I met some very friendly Motorhomers from Waiuku travelling together and also heading for the Art Deco events. Last time we were here this park had just opened and it was little more than a gate to a paddock but it is now, very well setup. The local committee has done a fabulous job of setting this up and it’s huge. There is water, a library, a rubbish recycling area and a big clothesline. The ground is solid, dead flat and well drained and setup for easy parking. About two thirds of it is roped off for expansion and is currently left for making hay. Already it is one of the associations busier parks so hats off to all those involved. That night there were some nice breezes wafting through which seemed to get rid of some of the humidity which was great. In the morning, we met some other Dethleffs owners who were full timing in their new Trend. 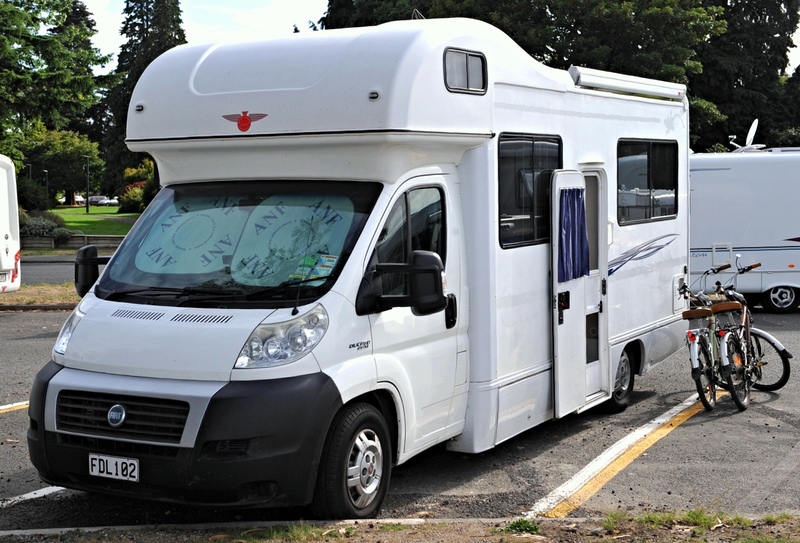 The Trend is quite a bit smaller and a lighter van than Rafe (Globe 4) but well equipped and a smart looking Motorhome. They had sold their house and were travelling around with their small dog trying to decide where they might buy land and build. 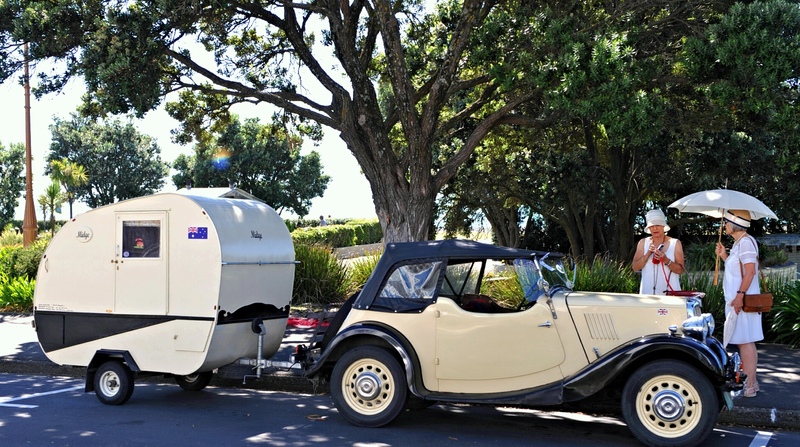 We left Eriksen rd around 11am and headed for the supermarket then the dump station then onto the NZMCA park on the waterfront for Motorhomes for the Art Deco event. At $50 for 5-6 nights right on the waterfront and a couple of k’s bike ride into town, this was great value. 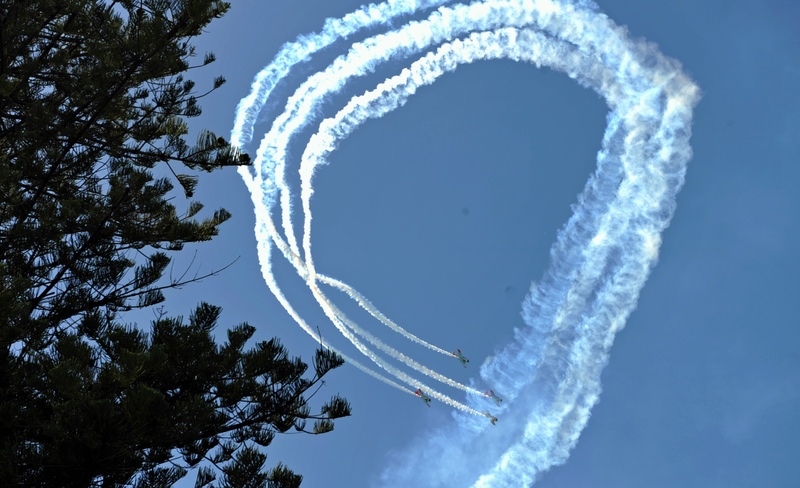 Within minutes of arriving as the park opened, we bumped into the Waiuku crews we’d met the night before and not long after that, some people we met in caravanning in Taupo rocked into the park as well. Fiona was on a mission to buy our grandson Ayden a birthday present so we biked into the town. The iconic Masonic Hotel was our first stop for something wet and cold and then after looking around, we found our way to Farmers. I had forgotten how hard it can be to buy for a 7 year old. Fiona rang daughter in law Sarah to get some ideas and in the end, we settled on a Star Wars toy. We had also lost our breadboard for the van so got a replacement one of those too. With these swinging on my handlebars in a bag, we arrived back to the Rafe an hour or so later when we were invited to a Bbq with our friends from Waiuku who were parked right behind us in three Motorhomes. 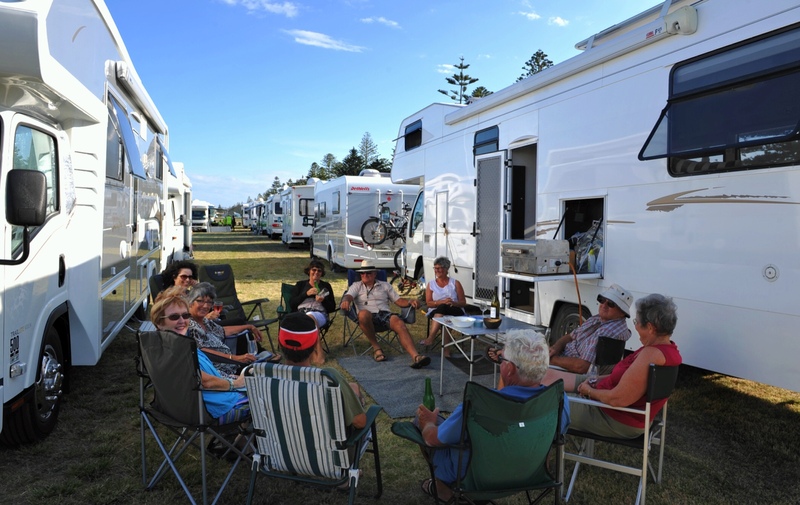 We briefly caught up with our caravanning friends from Whitianga for a drink before the Bbq. Another great night right next to the beach and while there, more Motorhomes rolled into the park. Down on the waterfront. Our friends from Whitianga with the red truck and caravan. After tea, I went for a walk down the beach to empty the rubbish and caught up with Bruce and Raewyn from the Kaipara who we’d met in Taupo in their very new Dethleffs Sunlight. The Sunlight is also a smaller van like the Trend but is slightly bigger than the Trend. They joined us later for a cup of tea in Rafe. A busy day at the office but a fun day with some nice people. The weather forecast is looking a bit suspect over the next few days but there are a couple of vineyard restaurants within biking distance from here before the Art Deco events really get started. After lifting in to place the pre made walls of the new scullery and enjoying another fantastic breakfast, Gary had a crack at Fiona’s sewing machine and fixed it ! Being clever with things like this and in his workshop from heaven, he managed to make it do the things it was supposed to do. Gary and Dianne were heading to Auckland to see a show so after a couple of great days and nights with them and after saying our goodbyes, we left and headed into Taupo. 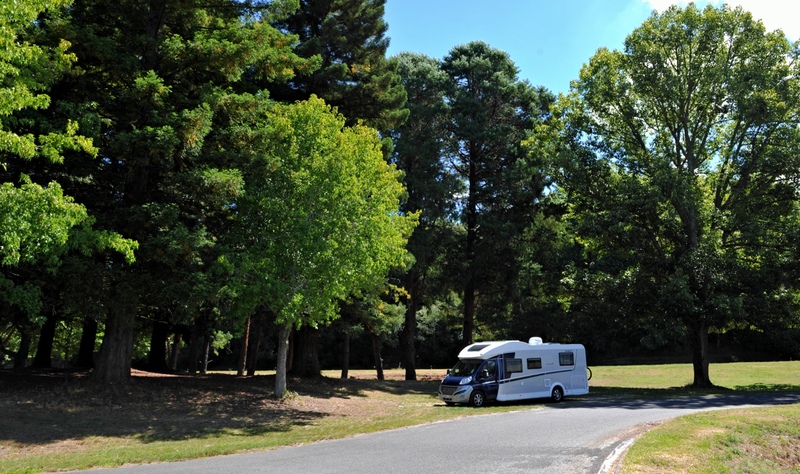 A visit to the dump station for emptying and water, then we stopped at one of the free waterfront Motorhome parks. We were right over the road from the Taupo park with a small train for kids, a superloo where you can have a shower and tidy yourself up for a few dollars, or play giant chess. It is also right in the middle of town and has a view all over the lake. You couldn’t be in a better spot. The sign writing on the road also allows for the magic 3 metres between vans for fire safety. Don’t forget to click on the images on this page for hi res. 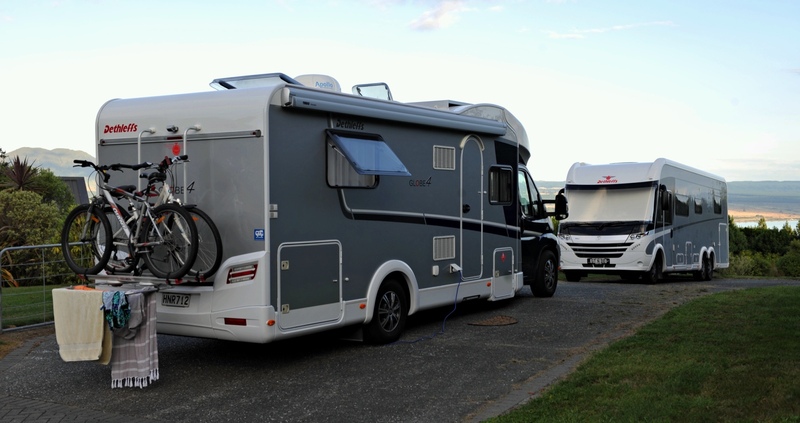 Within minutes of arriving, we met our neighbours right next door and later some people from Whitianga in their caravan who are also heading to Napier. We walked into town for lunch and Fiona did the shops. I checked out the park and headed back to Rafe for a read and a general blob. Later our neighbours popped in for a sundowner. Another great day on the road. Fiona has been working full weeks pretty much since Christmas to cover for others having holidays so we’ve been a bit restricted in getting away times. 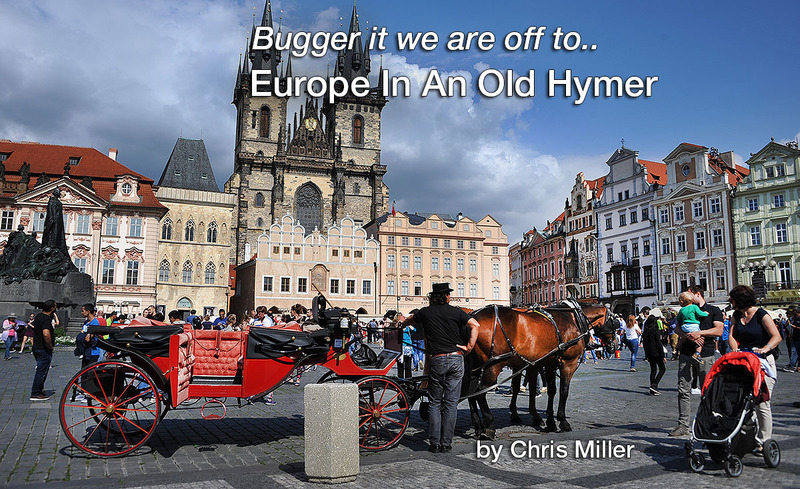 But that’s finished now so as the saying go’s .. Bugger it we’re off ! I spent Thursday getting the Rotoiti bugs off the front of the van, cleaning the floors and getting some basic provisions and then picked Fiona up from work. We headed out to Ardmore to stay with Alex, Sarah and the grandkids as its Liam’s birthday coming up and we will miss it. After a nice night with Alex and Sarah in the van, we left around 10am and after quick stops for water and fuel, we were off towards Taupo. A brilliantly fine day, not a cloud in the sky, our first stop was to be Cambridge for lunch. With the new motorway having gone through, it’s amazing how much less traffic is in Cambridge now, to the point that our favourite church cafe has closed down. As we came in to Cambridge, we passed a cafe called the Red Cherry which we’d stopped at before. Fantastic place. Plenty of parking around for big vehicles and they even sell their coffee Nespresso machine ready to take away. A pretty cruisy run through Tirau, Putaruru and Tokoroa where Fiona woke up from a long zzzz. By then, we weren’t far from Taupo. There is a neat rest area half along the road from Warakei to Taupo where you can look down over the Huka falls area. We stopped there for a cup of tea and then at Countdown in Taupo for ingredients for the curried chicken Fiona was making for tea. Kevo, Gary, Rossco and Nige the concrete expert. Their new house is amazing with views back over the lake towards Taupo. There is a vacant section right next door which has me twitching a wee bit. The whole area is stunning. With all the builders vehicles around, we were parked next to Gary and Diannes new XLI. The vans looked good up their with the view of Taupo behind. After a swim in the pool, it was time for tea and a few drinks. A great night with some great people in a lovely spot. On Saturday morning, the concrete truck arrived and it was all on. Nigel, Gary’s concrete expert was on the job and turned the fresh pour into a masterpiece. Having screed my father in laws concrete floor for a garage we built him years ago, I know how difficult this is but Nigel made it look so easy and it was just a pleasure to see such a great result. A good solid breakfast outside of bacon and eggs by Gary and we were set for the day. Breakfast with the builders. Concrete in the background. 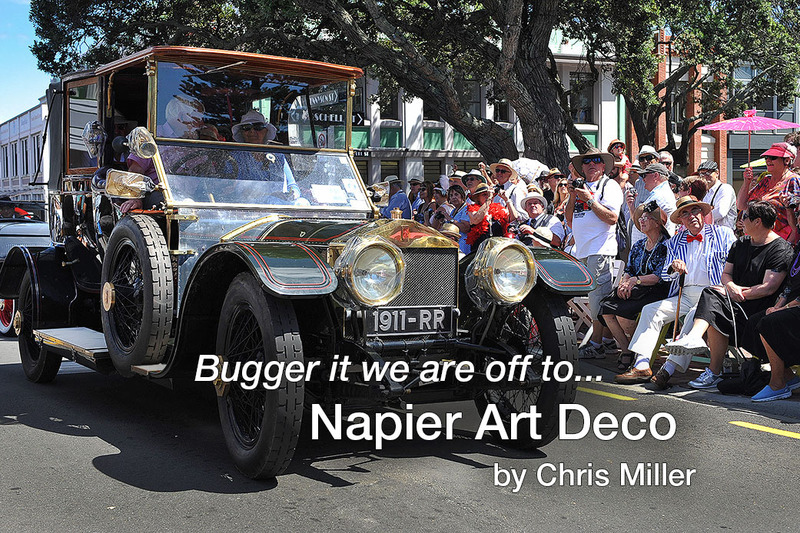 The schedule for today is for a nosey around Taupo then off to Napier for the Art Deco week.